This tutorial is part five of a series. It shows you how to use Jenkins to deploy upgrades to your application. 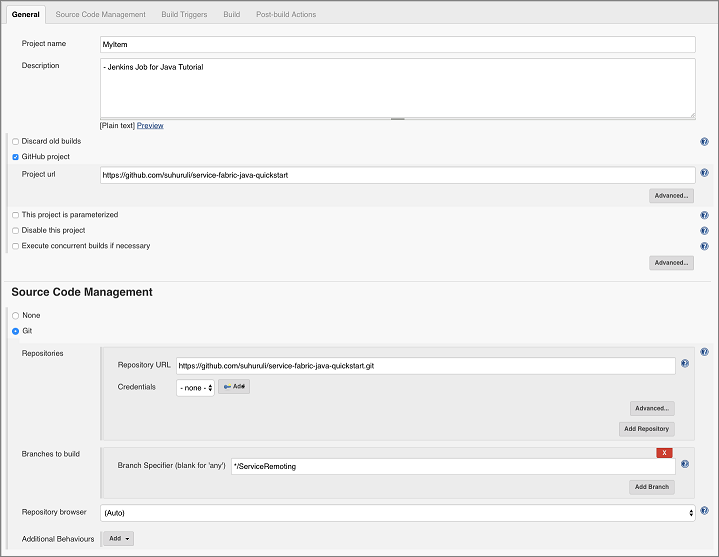 In this tutorial, the Service Fabric Jenkins plugin is used in combination with a GitHub repository hosting the Voting application to deploy the application to a cluster. Install Git on your local computer from the Git downloads page. For more information about Git, read the Git documentation. Have a working knowledge of Jenkins. Create a GitHub account and know how to use GitHub. Install Docker on your computer. You can set up Jenkins either inside or outside a Service Fabric cluster. The following instructions show how to set it up outside a cluster using a provided Docker image. However, a preconfigured Jenkins build environment can also be used. The following container image comes installed with the Service Fabric plugin and is ready for use with Service Fabric immediately. Pull the Service Fabric Jenkins container image: docker pull rapatchi/jenkins:v10. This image comes with Service Fabric Jenkins plugin pre-installed. Run the container image with the location where your Azure certificates are stored on your mounted local machine. If container ID is 2d24a73b5964, use 2d24. After you sign in for the first time, you can create your own user account or use the admin account. Set up GitHub to work with Jenkins by using the steps mentioned in Generating a new SSH key and adding it to the SSH agent. Since the commands are run from the Docker container, follow the instructions for the Linux environment. Use the instructions provided by GitHub to generate the SSH key. Next, add the SSH key to the GitHub account that is hosting the repository. Run the commands mentioned in the preceding link in the Jenkins Docker shell (and not on your host). Ensure that the cluster or machine where the Jenkins container image is hosted has a public-facing IP. Having a public-facing IP enables the Jenkins instance to receive notifications from GitHub. First, if you do not have a repository that you can use to host the Voting project on GitHub, create one. The repository is called dev_test for the remaining of this tutorial. Create a new item on your Jenkins dashboard at http://<HOST-IP>:8080. Enter an item name (for example, MyJob). Select free-style project, and click OK.
Go the job page, and click Configure. a. In the general section, select the checkbox for GitHub project, and specify your GitHub project URL. This URL hosts the Service Fabric Java application that you want to integrate with the Jenkins continuous integration, continuous deployment (CI/CD) flow (for example, https://github.com/testaccount/dev_test). b. Under the Source Code Management section, select Git. Specify the repository URL that hosts the Service Fabric Java application that you want to integrate with the Jenkins CI/CD flow (for example, https://github.com/testaccount/dev_test.git). Also, you can specify here which branch to build (for example, /master). a. Go to your GitHub repository page. Go to Settings > Integrations and Services. b. 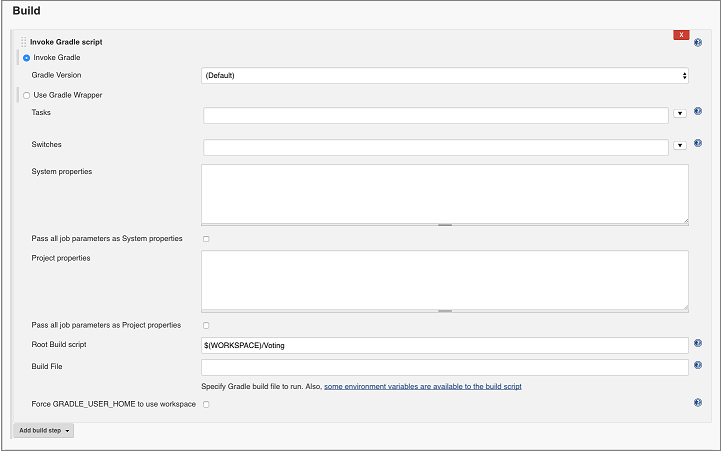 Select Add Service, type Jenkins, and select the Jenkins-GitHub plugin. c. Enter your Jenkins webhook URL (by default, it should be http://<PublicIPorFQDN>:8081/github-webhook/). Click add/update service. d. A test event is sent to your Jenkins instance. You should see a green check by the webhook in GitHub, and your project builds. Under the Build Triggers section, select which build option you want. For this example, you want to trigger a build whenever some push to the repository happens. So you select GitHub hook trigger for GITScm polling. Under the Build section, from the drop-down Add build step, select the option Invoke Gradle Script. In the widget that comes open the advanced menu, specify the path to Root build script for your application. It picks up build.gradle from the path specified and works accordingly. 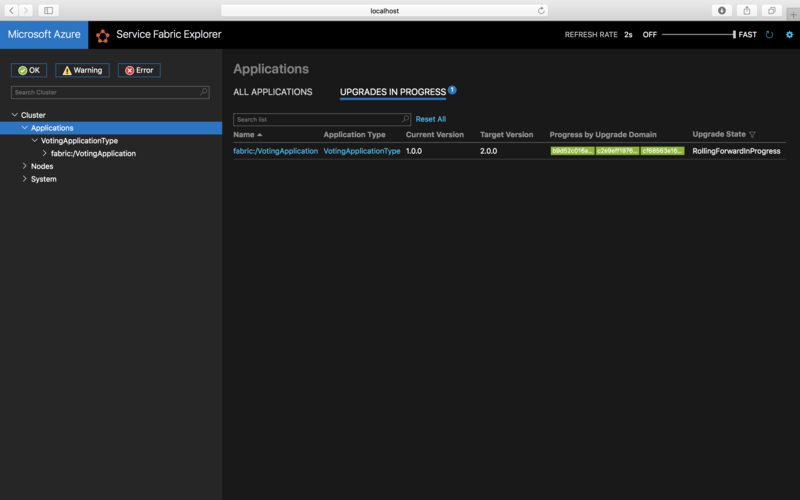 From the Post-Build Actions drop-down, select Deploy Service Fabric Project. Here you need to provide cluster details where the Jenkins compiled Service Fabric application would be deployed. The path to the certificate is where the volume was mounted (/tmp/myCerts). The cluster here could be same as the one hosting the Jenkins container application, in case you are using Service Fabric to deploy the Jenkins container image. Update the title of the HTML in the VotingApplication/VotingWebPkg/Code/wwwroot/index.html file with Service Fabric Voting Sample V2. Update the ApplicationTypeVersion and ServiceManifestVersion version to 2.0.0 in the Voting/VotingApplication/ApplicationManifest.xml file. Update the Version field in the ServiceManifest and the Version field in the CodePackage tag in the Voting/VotingApplication/VotingWebPkg/ServiceManifest.xml file to 2.0.0. To initialize a Jenkins job that performs an application upgrade, push your new changes to your GitHub repository. In Service Fabric Explorer, click on the Applications dropdown. To see the status of your upgrade, click on the Upgrades in Progress tab. If you access http://<Host-IP>:8080 the Voting application with full functionality is now up and running.